The magnificent sunshine added to the liturgical beauty of our Triduum celebration. 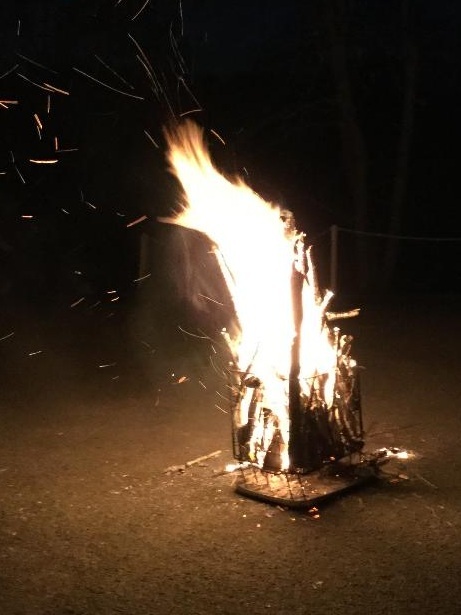 A photo of the Easter fire celebrating Christ our Light……. Posted on April 21, 2019 by Elizabeth Mann. Last week, S Reina and S Elizabeth Mary visited St Francis Primary School, Nailsea. The Community had received an invitation from the student Chaplaincy Team to come to talk to the school about prayer and about being Nuns. Assembly started with the hymn ‘I say YES, my Lord’ which everyone sung with great enthusiasm. This phrase was the theme throughout the assembly as S Reina recounted her own vocation story and S Elizabeth Mary responded to lots of questions. The questions then continued in the Year 6 classroom where our Sisters had a lovely welcome and enjoyed sharing ‘what it is like to be a nun’………..
Posted on March 21, 2019 by Elizabeth Mann. Posted on March 10, 2019 by Elizabeth Mann. In this week of Prayer for Christian Unity, we welcomed our Benedictine brothers and sisters from the Anglican Community of Mucknell, near Worcester. Each year, since the foundation of Brownshill in 2006, we have gathered together, either at Brownshill or at Mucknell, for tea and Vespers. Posted on January 21, 2019 by Elizabeth Mann. On reflection, I realised of course that this is precisely what Christmas is about: God coming right into the needs of our earthly life. It is so easy to start from the tinsel and decorations and Christmas wishes, or sometimes, sadly, WINTER Season Wishes, as if there were something mildly out of place and inappropriate about references to sickness, death, bereavement and loss. Perhaps we need to learn from the beautiful Winter Season that it carries its own message…that out of this seasonal death comes the stubborn resurgence of new Life, and that at the end of the day, Christmas and Easter are not that far apart. So let me begin on behalf of the Community with a very sincere and prayerful message to all of you who, in the last year, have borne any kind of loss and sadness, especially to those of you who are alone to bear your pain. We do pray a lot for your needs, the needs of those in our hearts, on our doorstep and indeed worldwide. At Brownshill it has been a busy year and we will begin our tour of events in the Guesthouse, where we have had the joy of welcoming so many, both newcomers and familiar faces. Throughout the year we have watched as a team have ably guided a group of students through the skills of Spiritual Direction. We are always struck by the endless gifts and talents we discover among our guests and friends. They are so generous in sharing these and their time: artistic representations of the local landscape and of the monastery, music lessons for our younger sisters, stone wall rebuilding, reception and household help, ‘chauffeuring’…... Remembering all this gives us the opportunity to thank you our friends who, in so many ways, add your helping hand week by week to the life of our Community here at Brownshill, including, of course, Fr Peter! Thank you all. At the beginning of the year, S M Apolline returned to Goma (Democratic Republic of the Congo) to be with her family following the death of her mother in November 2017. She was with them for the special moment of the ‘40th Day’ when they all gathered for a memorial Mass in our new Monastery Church at Goma, and met afterwards to share memories, photos and stories. We combined the lovely Feast of the Epiphany with the Community’s celebration of the Diamond Jubilee of S Mary Lucy. It began with Fr Peter’s traditional annual pre-lunch drinks and nibbles during which he proposed a toast to S Mary Lucy. The rest of the day was a round of celebrations. And just a month later it was S Elizabeth Mary’s turn to celebrate her Silver Jubilee in the company of family, friends and Bernardines. S Elizabeth Mary’s actual date was Shrove Tuesday, so we would be starting again with celebratory pancakes! Meanwhile we enjoyed her special day with her sister, Margaret, and her own family. One of S Elizabeth Mary’s lovely gifts was from Fr Peter, who had succeeded in setting up a wi-fi access in the Guests’ Dining Room. It was good to spend time together on both days as S Elizabeth Mary has had to be away a lot this year. Surely the most exciting of these was her visit to our sisters in Vietnam in October. Postponed from March, she flew out on 19th September for three weeks for her first visit to our fledgling Community there. 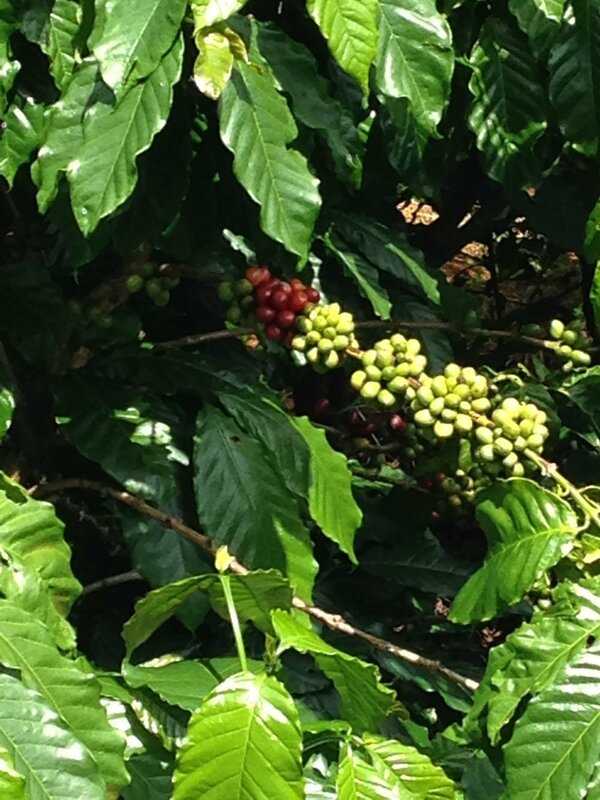 Most mornings, when not off to the local market on the back of a ‘moto’, she enjoyed helping with the beginning of the coffee harvest in our large plantation. But, above all, she appreciated simply sharing the life of our Community and getting to know the young sisters there. She returned with one of our Vietnamese sisters, S Marie Therese, but the latter was scooped up by S Maria at Heathrow Airport and taken directly to Hyning, so we would have to wait patiently for another few months to meet our sister. Meanwhile we were delighted to host our General Council for their meetings, as well as the French Novitiate: S Veronique (from the Congo) and S Francoise (from Vietnam) and Annabelle a postulant. Some very entertaining moments were spent in the kitchen, and afterwards at table as we tasted each other’s traditional dishes. The only sting in the tail was that the return journey for our French sisters was seriously upset by our English winter! It was our kind neighbour, Mark, who got them out and on their way through the snow. By March, however, we were enjoying an English Spring and a visit to St Bernard’s Secondary, Slough, for a last reunion with our past pupils after our departure in 2006. The head Teacher, many staff and present pupils prepared the day beautifully and assured us that the Bernardine spirit continues to animate the school. Another departure will be coming about as we transfer the Trusteeship of St Bernard’s Preparatory School, Slough, to St Benedict’s Ealing in the New Year. We shared our Goodbyes and Thank Yous on 21st November when most of our Communities of Hyning and Brownshill gathered at Prep. After the celebration of Mass with Bishop Peter Doyle of Northampton and Fr Kevin O’ Driscoll, Parish Priest at Langley, so beautifully prepared by staff and children alike, there was a reception. It was a time to remember and to give thanks for all the blessings since the foundation of the school in 1945, in the presence of many staff, both former and present, governors and friends. In addition to its unique ethos, we are proud to share that it was placed 4th in the Sunday Times listing of Independent preparatory schools when these were published a fortnight ago. Although sad, as this marks the end of our involvement in Catholic Education in the UK, we are confident that under the guidance of St Benedict both schools have a great future together. St Benedict leads me naturally to speak of our close relationship with our local Benedictine monks at Prinknash. We have been able to assist at some of their several events this year, both happy and sad as they mourned the loss of several brothers who have died in the course of the year, celebrated with Fr Martin his abbatial blessing as he takes over the pastoral care of his Monastery from Fr Francis, and celebrated too the first Profession of Brother Hugh. They have shown themselves true brothers to us, willingly celebrating Mass at Brownshill, if ever Fr Peter needs to be absent. It is always a joy to share some moments with them. Nor do we forget our Brothers and Sisters in St Benedict, at Mucknell, and we were able to share their rejoicing in the profession of Br Michael earlier this year. S Catherine received the warmest of welcomes when she made her Retreat at Douai Abbey in October. We enjoyed visits from several of our Cistercian Brothers and Sisters, S Jean from Whitland, S Catherine from Imari Japan and S Marie Joseph from France. These visits, and regular visits from our own Bernardine sisters, are truly enriching and build up the unity of our large and far-flung family. We are always glad to welcome priests and religious sisters from our own Diocese of Clifton and beyond, as they take precious days to relax with the Lord. In this context another bitter-sweet moment took place in the autumn as we said good bye to Canon Tom Gunning our Parish Priest and welcomed Fr Christopher Whitehead to our parish of Stroud. We owe much to both of them in all the comings and goings involved in their ministry; we confide them to the Lord. Among our visitors we want to mention the young people whose commitment to the Lord and depth of prayer always humble us. We also enjoy our own younger sisters’ enthusiasm for their own commitment to their vocation, their generous service, their joyfulness. Once again their formation took them away in the course of the year; this is enriching for them but also for their community. Our younger sisters spent a fruitful and enjoyable week with others in formation on Caldey Island exploring Monasticism in the 21st Century, ably led by Fr Michael Casey OCSO. In August, Sr Florence took the important step of renewing her vows for a further 2 years. A few days later she left for a month in Rome with other Cistercian Sisters and Brothers in Formation. During this enriching experience the high point seems to have been their visit to Subiaco, walking in the footsteps of St Benedict. We are blest to see quite an impressive group of young people following S Hilda in the Novitiate, including S Reina who joined us in Community here at Brownshill from Hyning in mid-August. We ask you to join us in praying for these and for all young people that they may realise their aspirations and dreams and listen in their turn to Jesus who brings to them “the voice of a father who loves you”. We could fill our Christmas Letter with details of these grace-filled events, and all the other lovely events of this year 2018. At the moment, S Marie Emmanuelle is back in her native France. She is being missed by Community and guests alike but is being ably replaced in the Guests’ Dining Room by S Reina. Meanwhile, S Mary Philippa continues her Spiritual Direction course, finding both the formation and the companionship of the lovely group enjoyable and very enriching. In some ways we end where we began. As I write we have just lived Remembrance Sunday. Many families are touched at this time, but as we kept this year the centenary of the end of the First World War, we hold in special honour all those who gave their lives, then and now, in war or peace, without counting the cost. Remembrance, Commemoration, Memory - all important strands on our Christian way. Here at Brownshill they reach their culmination every day as we celebrate the Eucharist and remember, not just Christ’s Christmas coming, but his abiding presence, and then we remember you all. For all of us, may He be the joy of our hearts, the spirit that inspires our vision and the strength for every step of our journey in the year ahead. Happy Christmas - Happy New Year. Posted on January 7, 2019 by Elizabeth Mann. Posted on December 20, 2018 by Elizabeth Mann. 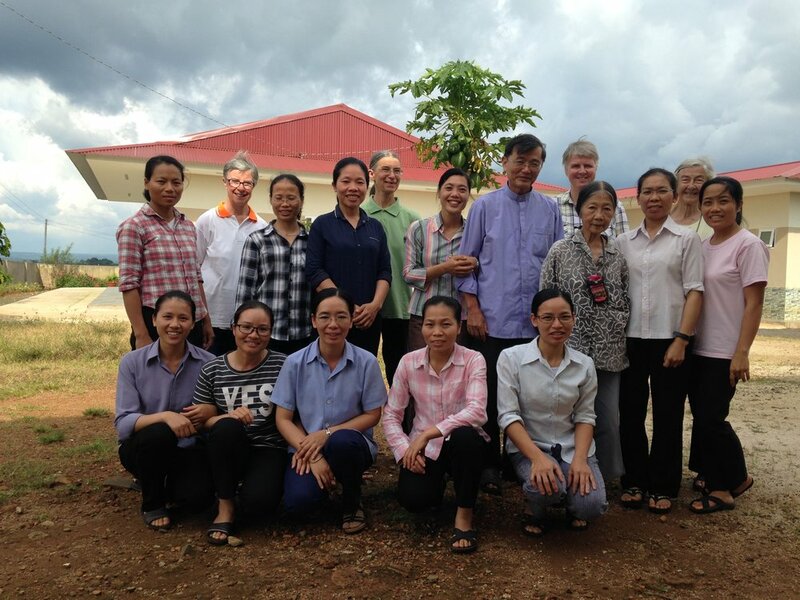 Sister Elizabeth Mary enjoyed a lovely three week stay with our fledgling Community in Vietnam, sharing their life and helping with the beginning of the coffee harvest……..
Posted on November 19, 2018 by Elizabeth Mann. Posted on August 22, 2018 by Elizabeth Mann. Posted on March 27, 2018 by Elizabeth Mann. Another heavier than expected snowfall......but beautiful in the afternoon sunshine! Posted on December 27, 2017 by Elizabeth Mann. Here is Sister Florence who arrived at Brownshill in August from our Community in Goma (DR Congo) with our 'snow-nun'.......her first ever snow and we thoroughly enjoyed it with her! Posted on December 24, 2017 by Elizabeth Mann. On Saturday 7th October, the school hall at St Bernard's, Westcliff, was full to celebrate a Memorial Mass for Sister Mary Stephen who died last January. Below is S Elizabeth Mary's 'Welcome' .......we hope that photos of the day will follow! As Bernardine Sisters, it is our privilege and great pleasure, having been welcomed so warmly ourselves, now to be ‘doing’ the welcome! This Mass and Reunion were first suggested back in January, on the day of S Mary Stephen’s funeral. It was a recognition of the need to remember and to give thanks ‘back home’ for her life, ‘at the roots’ if you like! S Mary Stephen spent so many years here at Westcliff: first as a student herself, a timid 11 year old (well, perhaps not very timid!) in 1943 with her cloakroom peg next to Sister Mary Lucy’s. After her novitiate at Slough and in France, she returned here, as a young teacher of French and RE (and her A level students will no doubt still have fond memories of her love for and teaching of John’s Gospel), subjects she continued as Deputy Headteacher and, then, as Headteacher, until the Community left in 1983. In these latter years, her influence extended beyond the walls of St Bernard’s. She gave much to Catholic Education in the deanery and diocese. It is a pleasure to welcome her former colleagues from other Catholic schools in the deanery. Thank you for coming. Thank you, too, to Bishop Thomas McMahon for accepting our invitation. It is lovely to have you with us. I am sure that you have many memories of the Westcliff Community and of Sister Mary Stephen from your days ‘next door’, as a young curate at St Helen’s in the 1960’s. Thank you, too, to Fr Joseph Whisstock, present Parish Priest ‘next door’ and brother of our Sister Maria. And I would like to express, on behalf of us all, our immense gratitude to Headteacher, Mr Tony Sharpe, and the present staff of St Bernard’s for all the preparations, generosity and organisation for today. Their ‘open door’ welcome has been greatly appreciated as, together, we watched the numbers grow……and grow! Thank you to Carmel Allen for overseeing all the practical arrangements (no mean feat!) and for being so easy to work with – yes, I did promise that I would not mention you! Thank you, too, to Fiona Maltby and the ‘band’ for our liturgy, and to the catering staff, site managers and everyone at the school who has contributed so much to today’s celebration. Finally, thank you to you all for coming……...and while we enjoy being together, we remember those unable to be with us today. In particular, John Ballard sends his apologies, and has asked me to pass on his greetings to all. He has recently had hip surgery and it is too soon to make the long journey up from Cornwall. But it is so good to see so many here and each one of us has her (or his) share in the welcome today as we meet each other anew, perhaps after several decades……and please do not worry about not recognising classmates or not being recognised yourselves, as I did in an email to one of my own former 5J classmates whom I have not seen in (cough) 34 years(!) In her reply, she confidently assured me that we still look 16 !!!!!!! I am sure that applies to every year-group! Welcome was a particular gift of Sister Mary Stephen, although perhaps not the immediate one we recognised on our first day at school here, most of us aged just 11, dressed no doubt in new stiff uniform which was just slightly too big for us. She had a certain ‘look’ that served as a reminder that she was the authority figure. Some of you stayed in touch with her over many years, recognising that, however stern that ‘look’ might have appeared at first, it soon transformed into one of welcome…..….a loving welcome, a non-judgemental welcome, a sharing welcome, an interested welcome, a caring and concerned welcome…..all qualities with which S Mary Stephen was gifted in abundance. Many of you have testified to the influence S Mary Stephen has had in your lives, comforting you in moments of sorrow, sharing the joys and the goodness of God in your lives, journeying with you in times of uncertainty, challenging you in those moments when you perhaps needed a ‘gentle prod’, sharing your life and faith journey. Thank you for being faithful in your friendship with her for so many years. She really did appreciate it and loved sharing your news with the rest of us in Community. S Mary Stephen quite simply loved ‘Westcliff’…..and would be so pleased that our young Sisters in formation, S Florence, S Reina and Julia are here. The next generation of Bernardines will ‘know’ Westcliff. Please say Hello to them! For others, she was perhaps the ‘public face’ of the Community of Bernardine Sisters, the Community whose presence reminded you of school and whose ongoing commitment to you, particularly in terms of prayer, has been a reassuring comfort at important moments in your lives. Those prayers continue and Mass is offered every month in both our Communities for our former students, staff, your families and intentions. Please do not lose touch. Others of you have not been in contact, perhaps have not darkened these doors since the day you left school and, yet, are drawn back by wanting to be part of ‘today’, perhaps simply out of a certain curiosity, or a feeling of wanting to be back in a place where you once ‘belonged’, perhaps by the desire to re-ignite friendships. S Mary Stephen treasured friendship and would have delighted in today. She would have chatted non-stop in the car going home about everyone she had met…..until she fell fast asleep, or, in her own words, just closed her eyes for a moment! Yes, her mind and her spirit were alert to her last conscious moment; it was her body that failed her in those last 18 months. Months first of denial then of growing frustration when she had no choice but to give in to the decreasing mobility and increasing dependence….not easy for her and, ‘old age’ really suit her, as you can well imagine ! It was a journey we lived with her, but could not live for her. She died peacefully, simply slipping into the Lord who awaits each of us in Love. But, today, in faith, we celebrate her life with gratitude. We entrust her to the Lord’s unconditional and infinite Love……..He who, in the words from her beloved John’s Gospel, came ‘that we might have life, and have it to the full’, He whom she loved and served so faithfully throughout 61 years of monastic life. Death is part of the Paschal Mystery we are to celebrate now in this Eucharist: Christ’s Passion, His Death and His glorious Resurrection. Posted on October 9, 2017 by Elizabeth Mann. Last weekend we had the great joy of celebrating Sister Mary Lucy's Diamond Jubilee surrounded by five generations of her family! Her choice of Readings for her Jubilee Mass spoke primarily of God's love, revealed in His creation (Wisdom 13), revealed in Jesus (Eph 3 : 14 - 21) and his invitation to 'Remain in my Love' (John 15 : 9 -17). Posted on September 21, 2017 by Elizabeth Mann. Last week we had the great joy of welcoming the AMICIS group to Brownshill . S M Helen, our Prioress General, hosted the meeting here this year. The group composed of Abbots and Abesses from France, Spain Switzerland, Austria and Hungary, with the Abbot General O.Cist., Dom Mauro, from Rome. The Community enjoyed hearing about life in each of our guest's monasteries. We enjoyed a day out at Littlemore, following the footsteps of Blessed John Henry Newman, and Oxford where we were warmly welcomed by the Dean of ChristChurch and were the guests at the College's beautifully sung Evensong. We celebrated the group's time with us with a very English Fish and Chip lunch. Posted on May 31, 2017 by Elizabeth Mann. S M Stephen's Requiem Mass will be celebrated this Wednesday (25th) at 11.30a.m. at the Parish Church of the Immaculate Conception in Stroud (GL5 4AA). All are welcome, but please be prepared to squeeze up as necessary and perhaps even stand. There is no parking at the Church but it is in the centre of the small town so any of the town's car parks are suitable. Alternatively, it is a shortish walk from both the train and bus station. After Mass, there will be tea/coffee and sandwiches in the Church Hall (have plucked a number out of the sky for the caterers!) so please do join us. We are VERY grateful to Canon Tom Gunning for his generous welcome in the Parish and for all that he and his parishioners are doing to facilitate the funeral. On Wednesday afternoon after the funeral Mass, the Community will drive up to Hyning. We have a beautiful cemetery there in the corner of Hyning's lovely garden, overlooking Ingleborough and the other north Pennine peaks. Thursday is, for us, the Feast of the Cistercian Founders, Saints Robert, Alberic and Stephen Harding and S Mary Stephen will be buried after Mass there, on coincidentally her own feast day. Posted on January 23, 2017 by Michaela Toulmin. The celebration, as all professions, was moving. We were delighted to join S Reina's friend to witness this important step in her response to the Lord's call. Monastic life involves the radical gift of oneself to God - there are no short cuts! Posted on October 27, 2016 by Elizabeth Mann.